Michael Lauck is a columnist for iTricks, his work appears on Mondays… usually. Almost 70 years ago the actor, writer and director Orson Welles added a new title to his resume: magician. 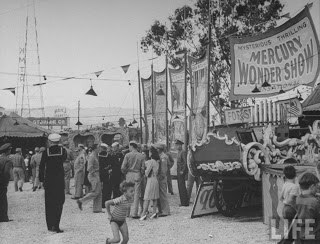 The Mercury Wonder Show was a circus of magic performed under a custom made big top tent and used A-list celebrities as assistants. Even though it personally cost Welles’ tens of thousands of dollars, 2/3 of the tickets were free and all the proceeds went to charity. To call Orson Welles a Hollywood legend is not an exaggeration. Citizen Kane, which is considered the greatest film of all time by many critics and the American Film Institute, was co-written, produced and directed by Welles who also starred as the title character. It was Welles’ first feature film. He had already found success on the stage as an actor, then as a director for the Federal Theater Project and as the co-founder (with John Houseman) of the Mercury Theatre. As the original voice of The Shadow he helped launch one of the most successful characters in radio. He was also able to bring his Mercury Theatre company to the radio and their War of the Worlds episode is arguably the most famous radio show ever broadcast. It is known even today as a work so jarring it made people actually believe that Mars had invaded (although there is a evidence to support that this was more newspaper hype than fact which Welles used to gain a sponsor and publicity for his show). When the United States was thrust into World War II in late 1941, Orson Welles was a household name. He had an interest in magic going back to his childhood. According to a tribute to Welles after his death penned by Jim Steinmeyer in the November, 1985 Genii, as a boy of about 10 Orson Welles not only saw Houdini perform, but was also introduced to him backstage. He maintained that the magician taught him a card move and told him that a magician must practice something 1,000 times before ever performing it. However, he then witnessed Houdini being shown a new mechanical prop from Germany which caused the showman to exclaim it would be added to the show immediately! Nonetheless, a passion for magic continued to grow. In 1937 he staged a production of Doctor Faustus which featured the floating, appearing and vanishing of both props and characters thanks to Black Art. Welles spent 1942 performing odd vaudeville dates and army camp shows as a magician with movie star (and girlfriend) Delores Del Rio acting as his lovely assistant. Has Hollywood geared up to help with the war effort by boosting morale and raising money, Welles decided that he would do his part by putting on an old fashioned big top magic show for the troops and donate the money made from non-servicemen tickets to charity. The Mercury Wonder Show spent 11 weeks in rehearsal before premiering on August 3, 1943. Welles had a special big top tent created which sat 1,500 and was surrounded by concession stands, sideshows and a ticket wagon. Opening night tickets were $11, although the normal prices were $2.75 and $5.50 (with the money going to the Hollywood Assistance League) for the 500 seats offered to the public. The remaining 1,000 tickets were given to servicemen free of charge. Outside a calliope played while a circus band played under the tent throughout the 90 minute show. No one is exactly sure how much Welles invested in the production, but reports ranged from $30,000 to $50,000. He recruited Mercury Theatre alumni Agnes Moorehead and Joseph Cotten to donate their time as part of the cast as well as his new girlfriend (and soon to be wife) Rita Hayworth. Although it was reported that she had to leave the show to make a movie at the time, Welles would later say that her studio bosses, Harry Cohn in particular, found the star’s participation in a magic show demeaning. Shortly after Hayworth’s departure Marlene Dietrich was added in her place. For the short period the show was left without a glamorous Hollywood actress, a young comic and magician named Johnny Carson reportedly filled in. From the period reviews of the show in magazines such as Genii and Linking Ring, many of the effects presented by Welles are known. The show opened with a flash appearance by Welles who then proceeded to materialized a goldfish bowl. Soon, it was joined by a dozen or two chickens, roosters and ducks produced from various boxes. A chicken (or rooster, reports vary) was then hypnotized by the charismatic magician who wrung its neck before restoring the poor animal. Several rings were borrowed from the audience and then most were found in a nest of boxes that hung from the top of the tent. One was found on a duck that was produced and the final ring, which belonged to a serviceman, was found attached to the garter of a lovely assistant Orson Welles had produced from a dollhouse (the owner of the ring was then allowed to retrieve his ring, to the delight of the audience). This was only the beginning of the show! Cards were vanished and discovered in an orange and balloon. A bill was retrieved from an egg. Joseph Cotten performed a sub trunk routine with one of the show’s many lovely assistants (Genii described these assistants as Hollywood “sweater girls”). Welles would saw an assistant in half, restore her, cause her to float and eventually vanish as well. Interestingly, neither Genii nor Linking Ring reports Rita Hayworth as being involved with these effects even though Harry Cohn was supposedly specifically bothered by the idea of her being cleaved in twain. Dell O’Dell did write about Rita Hayworth in her coverage of the Mercury Wonder Show published in the September, 1943 Linking Ring. She reported that Hayworth presented a mind reading act while wearing a “beautiful white tight fitting gown.” A lucky GI was selected from the audience to be her subject. The glamorous star wrote down the thoughts she received from the volunteer on a slate that was handed to Welles who read it, furiously erased it and chased the poor sucker from the stage! One can only assume that the act was modified if Johnny Carson did indeed fill in for Hayworth. There was more magic on the bill. Orson Welles performed wand vanishes, hypnotized a soldier and restored a turban that had been set aflame. He also presented his version of the needle act. Joseph Cotten, known as Jo-jo the Great for the duration of the Mercury Wonder Show, appeared in the finale dressed as an explorer with Welles costumed as a witch doctor. After a bit of comedy the two men performed a quick change act to close the show. There does not appear to be a film record of the actual Mercury Wonder Show, but a short segment in the 1944 film “Follow The Boys” does capture a sample of the fast paced magic and comedy presented. Although the Mercury Wonder Show only ran through September, it was not Welles’ only foray into magic. His post-war Broadway show All Around The World included a 10 minute magic act. He also toured German in 1950 with a show that included music and magic with dramatic vignettes. Welles presented a similar show a few years later in Las Vegas. He portrayed a magician in several films, including performing a levitation (for no real reason) in the 1967 spoof version of Casino Royale. He often performed magic during talk show appearances and in an episode of I Love Lucy was forced to use Lucille Ball as an assistant. Orson Welles also hosted the 1982 special Magic with the Stars and appeared in 1978′s The Magic of David Copperfield. Welles passed away in 1985. Among his unfinished films were segments he had shot over the years for a magic television special he was planning. The segments have been edited together by the Munich Film Museum and are sometimes presented at film festivals. Posted by Michael on Thursday, July 25th, 2013 at 2:17 am.